خدیور, آمنه, عباسی, فاطمه. (1395). ارزیابی بلوغ مدیریت دانش در سیصد شرکت برتر ایرانی. 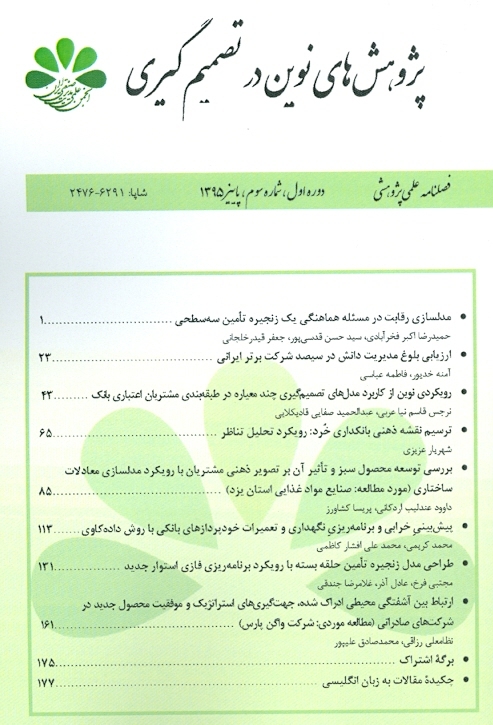 پژوهش های نوین در تصمیم گیری, 1(3), 23-42. آمنه خدیور; فاطمه عباسی. "ارزیابی بلوغ مدیریت دانش در سیصد شرکت برتر ایرانی". پژوهش های نوین در تصمیم گیری, 1, 3, 1395, 23-42. خدیور, آمنه, عباسی, فاطمه. (1395). 'ارزیابی بلوغ مدیریت دانش در سیصد شرکت برتر ایرانی', پژوهش های نوین در تصمیم گیری, 1(3), pp. 23-42. خدیور, آمنه, عباسی, فاطمه. ارزیابی بلوغ مدیریت دانش در سیصد شرکت برتر ایرانی. پژوهش های نوین در تصمیم گیری, 1395; 1(3): 23-42. 1Assistant Professor, IT management, Faculty of Social and Economic Sciences, Alzahra University, Tehran, Iran. Rezayaimansesh Behroz, Mohamadnabi Sina (2012) "The application of knowledge management maturity level assessment", Journal of Research Institute of Information Science and Technology, 14(4): 985-1009. Mosakhani Mohamad, Manian Amir, Ehghaghi Elham (2014) "Maturity assessment model developed in co-operation network between the enterprise network Shabab", Journal Management Research in Iran, 18(3): 180-157. Kaur J. (2014) "Comparative study of capability maturity model", International Journal of Advanced Research in Computer Science & Technology, 47-49. Pashazadeh Yosuf, Gohari Ali (2012) "Evaluate the effect knowledge management maturity on quality of service and innovation", The Fifth Conference on Knowledge Management, Tehran. Veenendaal E. (2012) Test Maturity Model Integration (TMMI), Ireland: TMMi Foundation. Pirkkalainen H., Pawlowski J.; Global Social Knowledge Management: From Barriers to the Selection of Social Tools. Electronic Journal of Knowledge Management, 1-17,2013. Gallagher, S., & Hazlett, S.-A. (1999) "Using the knowledge management maturity model (KM3) as an evaluation tool", Knowledge Mgt, 1-29. Parlby D. (2000) Knowledge management research report 2000, KPMG Consulting. Kochikar V. (2000) The knowledge management maturity model - a staged framework for leveraging knowledge, Infosys Technologies Ltd.
 Klimko G. (2007) "Knowledge management and maturity models: Building common understanding: 2 nd European Conference on Knowledge Management", Slovenia: IEDC Bled School of Management, pp.269-279. Lee J., Kim Y. (2001) "A stage model of organizational knowledge management: A latent content analysis", Expert Systems with Applications, pp. 299-311. Ehms K., Langen M. (2002) Holistic development of knowledge management with KMMM. Weerdmeester R., Pocaterra C., Hefke M. (2003) "VISION next-generation knowledge management D5.2. knowledge management maturity model", Information Societies Technology (IST) Programme. Kulkarni U., Freeze R. (2004) Development and validation of a knowledge management capability assessment model", The 25th International Conference on Information Systems. Mohanty, S., & Chand, M. ; 5iKM3 knowledge management maturity model. TATA, 2004. Paulzen O., Perc P. (2006) "A maturity model for quality improvment in kmowledge management", CIS. Rabinson H., Anumba C., Carrillo P., Al.Ghassani A. (2006) "STEPS: Knowledge management maturity roadmap for corporate sustainbility", Business Process Management Journal, pp.793-808. Hsieh P., Lin B., Lin C. (2009) "The construction and application of knowledge navigator model (KNM TM): The evaluation of knowledge management maturity", Expert Systems with Applications, pp. 4087-4100. Cindy H., Darcy L. (2009) APQC stages of KM maturity . Patrizi J., Levin G. (2007) A knowledge management maturity model for a global field services organization, KM. Andersen A. (1999) Knowledge Mangemt Assessment Tools (KMTA). Hubert C., Lemons D. (2010) APQC’s Levels of Knowledge Management Maturity, APQC, 1-5. Sinha R., Date H. (2013) "A comparative analysis of knowledge management maturity models”, International Journal of Innoative Research and Studies, pp. 221-234. Hasangholipor Tahmores, Abedi Jafari Hasan, Khatibian Neda (2009) "Assess the level of maturity of knowledge management in organizations through a developed knowledge management maturity model", Journal of Management Sciences, pp. 121-148. Kulkarni U., Freeze R. (2008) "Measuring knowledge management capabilities", Journal of Knowledge Management, pp. 1-20. Demchig B. (2015) "Knowledge management capability level assessment of the higher education institutions: Case study from Mongolia", Procedia - Social and Behavioral Sciences, pp. 3633 – 3640. Mosakhani Mohamad, Ajali Ghashlajoghi, Safavi Mirmahale Rahim (2010) "Providing a model for assessing the readiness of organizations in the field of knowledge management (Case Study: Statistical Center of Iran)", JournalManagement Research in Iran, 2(66): 221-244. Arias-Perez J., Durango-Yepes C. (2015) "Exploring knowledge management maturity from funcionalist and interpretivist perspectives", Entramado, 11(1): 94-104. Serenko A., Bontis N. (2015) "An application of the knowledge management maturity model: The case of credit unions", Knowledge Management Research & Practice, 1(15): 1-15. IMI100, 100 top Iranian Companies. Retrieved from IMI100: http://imi100.imi.ir/SitePages/Home.aspx , 2016.05.01. Azar Adel, Momeni Mansor (1998) Statistics and its application in management, Samt, Tehran.